Hueco Tanks are three massive granite outcrops which rise several hundred feet high. The natural cisterns, or "tanks," collect rainwater which has supplied humans and animals with drinking water for almost 10,000 years. The park includes pictograph sites near the tanks and adjacent rock shelters, and the ruins of a 19th-century stagecoach station and abandoned ranch buildings. Visitors must walk to see many features. 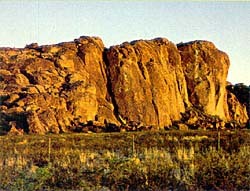 Hueco Tanks State Historic Park is located about 32 miles northeast of El Paso, off U.S. Hwy. 62/180. The park is open daily October-April from 8:00am to 6:00pm; May-September from 8:00am to 6:00pm Monday-Thursday and 7:00am to 7:00pm Friday-Sunday. There is a fee for admission. Reservations are recommended; for next day reservations, camping and tour reservations call 915-849-6684, all other reservations call 512-389-8900. For further information call 915-857-1135 or visit Hueco Tank's website.